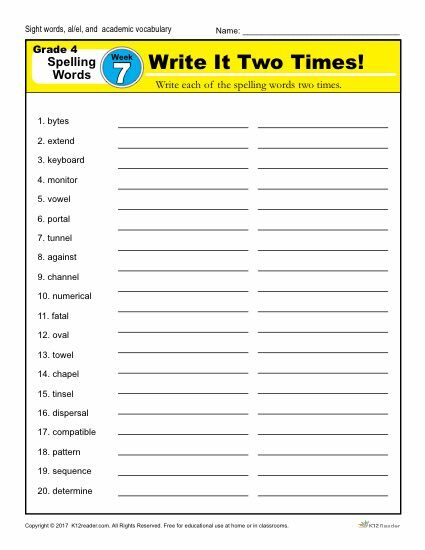 The 4th grade spelling words for week 7 is made up of 20 words that include sight words, al/el, and academic vocabulary. There are 5 activities to help students master the words: Write it Two Times activity, Circle the Correct Spelling activity, Dictation Sentences (where the teacher/parent says the sentence and the student writes it), and two Write a Sentence activities. Spelling words include: bytes, extend, keyboard, monitor, vowel, portal, tunnel, against, channel, numerical, fatal, oval, towel, chapel, dispersal, compatible, pattern, sequence, and determine. This week’s spelling list is part of our free 36 week 4th grade spelling program. This week’s spelling activity is part of our free 36 week 4th grade spelling words curriculum.